As soon as I saw the set Frightful Night I started thinking about non-Halloween ways to use it. I knew the house would be super versatile, but the more I thought about it the more I realized the possibilties with images other than the house as well. For this 6.25" x 3.5" card I wanted to create a happy little scene. 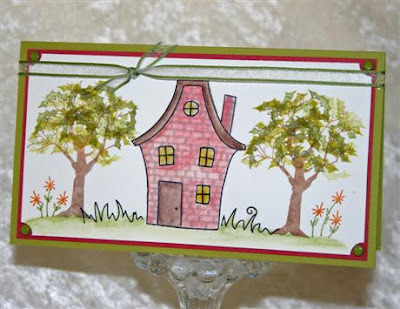 The house is watercolored with SU watercolor crayons and an aquapainter and then the brick mortar was drawn in with a gray Copic marker. There is Crystal Effects covering the windows for shine and dimension. See those cute little orange flowers? Those were actually my hubby's idea! I used one of the stars that comes attached to the house image to create the flowers and I hand drew in the stems and leaves. I cut all three stars off the house image to use them separately. A little tip if you decide to do the same - you do not need to trim them super close because the SASI rubber is so deeply etched you will not have much problem with catching edges. I actually trimmed mine a little too close and they are so small that there's barely enough cling mount to stick to my acrylic blocks. LOL! Live and learn! Now what about those trees? Have you figured out how I made the leaves? Yep - the leaves are made with the image of the three bats! How cool is that? I'm not usually one to *think outside the box* like that so when I came up with this idea I was totally bouncing out of my chair! I've made up a quick tutorial using fall colors to show you how to make a tree for any season that's not scary at all using that haunting tree image from Frightful Night. 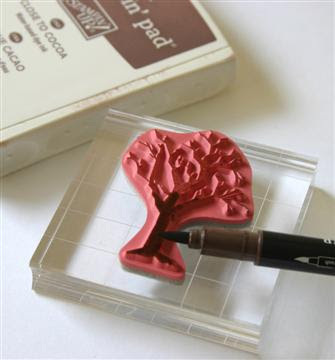 Step 1: ink up the tree with Close to Cocoa ink and use a Chocolate Chip marker to just darken just the lower portion. 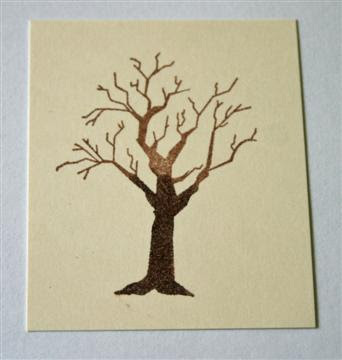 Here's how the tree image looks stamped onto Poison Ivory Shimmer cardstock. Step 2. Starting with More Mustard ink stamp the bats once full strength and again without inking up the stamp again. This will give you some dark and some light leaves. Then turn the bat image upside down and repeat being sure to vary where you stamp light and where you stamp dark. Step 3. Repeat the above with Really Rust ink. 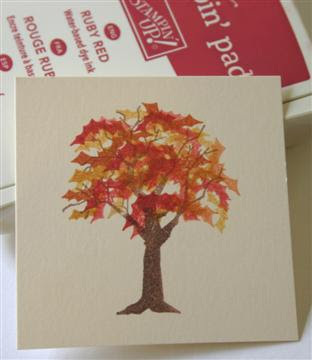 Now it's starting to look an Autumn tree. Step 4. Repeat the above with Ruby Red filling in as needed. Since Ruby Red is the darkest color I stamped it the least amount of times. After the Red I went back in with the Mustard and filled in a couple of spots. Now you have a Fall tree. Complete your card as desired. 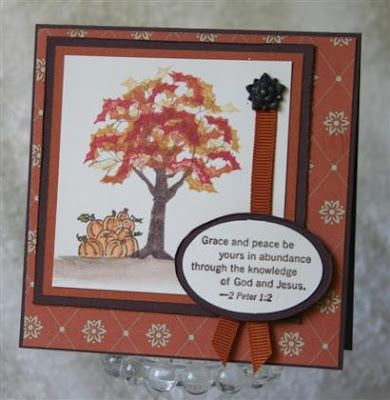 Here's my finished card using SU dp Apple Cider along with the pumpkins from Loads of Love Accessories and a beautiful verse from the retired SU set God's Way. 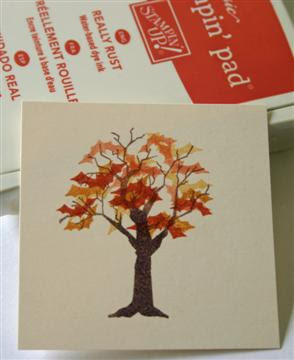 And you have to also see the Fall tree that Sharon Harnist created with just the tips of her Copic markers - check it out here. Very cool Sharon! My challenge to you is to create a card or scrapbook page using the tree from Frightful Night in a totally non-scary way! Let's see what you can come up with. Post your creation to the SCS gallery with 2 keywords (with a comma in between) - SASI, SASItree. Bonus points (LOL!) for using other stamps from that set in new or different ways! A note about uploading Stamp a Sweet Impressions creations to SCS - there is now a company gallery listed for Taylored Expressions. ALL the company galleries are completely keyword driven, so to make sure your uploads shows in the TE Gallery please be sure to use the keyword SASI. There are other keywords that also work, but SASI is the simplest most sure-fire one to use. Thanks for stopping by. Have a sweet day! Just awesome, Jami! LOVE those bat trees! So creative! Wow, Jami, I love your spring/summery scene. Soooo clever! Thanks for writing up the tutorial too on the leaves. Very cool! Very clever! Love the colors and the cute little house! TFS! 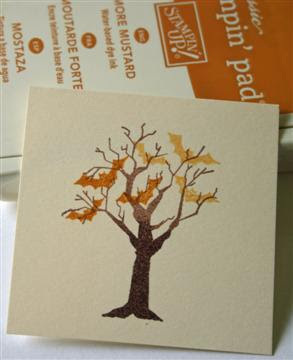 Wow Jami, this is sheer genius...LOVE that tree with the "bat" leaves...darling card!! TFS! Oh my word! Jami, you are just the clever BOMB! (Sorry .. had to borrow that from Cami!) WOW! Your bat leaves are genius, Jami -- love them! And your cards are beautiful -- I hadn't seen that 2nd one, gorgeous colors! How batty sneaky of you! *in best Dracula voice* Very pretty cards. I think the first one is my favorite because it's cute and I've never seen one similar to it before! You're kidding! I thought those were maple leaves--how cool!! Stinking, stinking cute!!! LOVE IT! Wow! How creative of you! Love how you used the bat image for leaves! Thats hysterical! Great job on both cards. I love them both.